As an additional benefit to its members, the ACPA has purchased an EZ Child Identification System that you now have the unique opportunity to access and use. 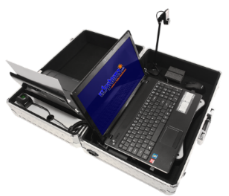 The EZ Child Identification System is an all-inclusive kit that allows digital fingerprinting, photographing, video and audio taping of a child and/or elder in a matter of minutes. The system will also provide an identification card that can be laminated and a copy of the information on a CD upon departure. For additional information on this system, please visit http://www.ezchildid.com/. Contact Vickie Owen, ACPA President, either by e-mail or phone at 480-635-7521, to check availability of the system. Complete the 'System Request Form' (below). Arrange for pick-up and return delivery of equipment with Vickie by e-mail or by calling 480-635-7521. Please read and digitally sign below that you understand the Requirements for checking out the EZ Child ID System from the Arizona Crime Prevention Association. 3. I agree to return said equipment in the same condition with which it is being borrowed and that I will verify its condition and function with the ACPA, Inc. prior to borrowing and upon its return. 4. I agree to be the person responsible for the equipment during the event and I will review the EZ Child ID "User Manual" found at: http://www.ezchildid.com/ prior to the event. 5. I agree that I will arrange for pick-up of the equipment from the ACPA, Inc. and that the return of the equipment will be made within four (4) days after our event. 7. We will provide our event/program flyer to the ACPA. I agree, if doing DNA collection as part of our event, we will take the collection in a manner advised by the ACPA's Step by Step Collection procedures found here (PDF). If you are not familiar with the equipment, we suggest you pick it up a few days early in order to become familiar with it prior to your event. By entering your required information below, you are indicating that you have read and understand the above stipulations and agree to them. Terms of agreement. * I have read and agree to the terms of agreement. Please provide any additional information about your request.